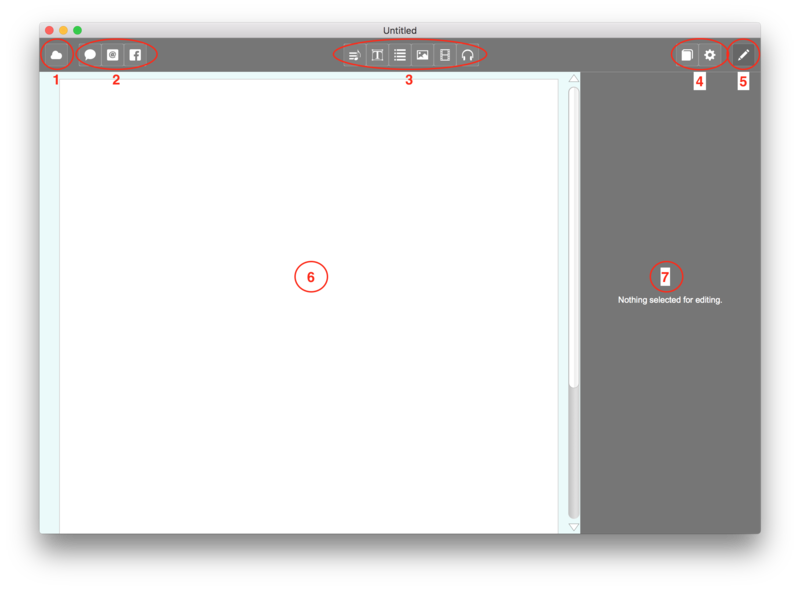 The Harmonia app opens to a blank white page flanked by a series of iconic buttons across the top of the window and a grey edit panel located on the right side of the window. The main features of the Harmonia window are briefly identified below, please consult our on-line documentation for detailed descriptions of the various buttons and editors. Cloud sign in button. Your computer must be on the network to sign into the cloud. Signing in enables teachers to access enhanced application features such as the ability to create lessons, assignments and practices. Students sign in to access and complete their posted assignments available in their cloud menu. Social media buttons. Use these to access Harmonia forums, send e-mail to us, and visit our facebook page! Content creation buttons. See Quick Guide to Content Creation for more information. Access the document settings and the application settings. The main content view (currently empty). The edit panel (currently empty). After creating a blank document teachers add various kinds of content to create interactive, multimedia documents such as the one shown directly below. Page content can include text, multiple choice questions, music scores, images, and A/V resources such as audio clips, midi files and video links. Music scores that have been added to a page can then be converted into composition or analysis assignments. Text boxes. These can contain stylized text and music theory symbols. Audio and video attachments viewable within the app. Embedded png or jpeg images. Context appropriate editors for the selected item on the page. Music scores with automatic analysis. These can be easily turned into analysis and composition exercises. Multiple choice question and answers. The Harmonia menu bar displays of a series menus containing global application commands. Creates a new document window. Keyboard command: ⌘N, (CTRL+N Windows). Opens a document file stored on the computer. Keyboard command: ⌘O, (CTRL+O Windows). Submenu containing the most recently opened documents. Opens a directory window listing the contents of the Harmonia Documents folder. On the Mac this folder is initially set to "~/Documents/Harmonia". On Windows, it might be "My Documents\Harmonia". The directory can be changed in Harmonia's Application Settings editor. Imports a MusicXml score so that it can be added to documents, and automatically analyzed. Saves the current file. You must sign in to activate the Save command. Saves the current file under a new name. You must sign in to activate the Save As... command. Saves the current document as a PDF file suitable for printing or saving a rec. Grades an assignment document. The grade report is automatically uploaded to the cloud course. Keyboard command: ⌘G, (CTRL+G Windows). Allows a student to retake an already graded practice document, or an assignment that allows multiple submissions. Keyboard command: ⌘R, (CTRL+R Windows). Allows a student to continue to work on an assignment that permits incremental grading Keyboard command: ⌥⌘R, (CTRL+OPTION+R Windows). Manually updates the Cloud menu with course information from the server. This command is only needed if there was a network interruption after signing in. Attempts to upload the document to the cloud course. This command is only needed if there was a network interruption after an assignment was graded. If the grade wasn't able to be sent (because the internet was down, for example), you can select this to try to send it again. Undoes the last edit command. Keyboard command: ⌘Z, (CTRL+Z Windows). Redoes the last undo. Keyboard command: ⇧⌘Z, (SHIFT+CTRL+Z Windows). Deletes the current selection from the document and adds it to the clipboard. Keyboard command: ⌘X, (CTRL+X Windows). Copies the current selection to the clipboard. Keyboard command: ⌘C, (CTRL+C Windows). Inserts copied material into the document. Keyboard command: ⌘V, (CTRL+V Windows). Deletes the current selection from the document. The deleted material is not added to the clipboard. Claims the remainder of the line containing the cursor such that the next object added to the page will begin on a new line. Claims the remainder of the page such that the next object added will start on the next page. Selects all the text in a text object. Initiates the countdown in a timed assignment. Change zoom factor to default document size. ⌘=, (CTRL+0 Windows). Zoom in view on current document. ⌘+, (CTRL++ Windows). Zoom out view on current document. ⌘-, (CTRL+- Windows). Change page display to portrait orientation. Change page display to landscape orientation. Single page display scrolls left to right. Equivalent to clicking the Cloud icon button locate in the top-left corner of the document window. Opens a dialog for the user to enter their user id (registered email address) and password to access course content in the Harmonia cloud and enable certain application commands. Unless you are using a Lab build of Harmonia the Sign In dialog will remember your id and password for subsequent sessions. You can also enable auto-login in the Application Settings editor. Upon successful sign in the Cloud Button turns blue and the Cloud menu will contain submenus for all Harmonia courses you are currently registered with. Sends a burst of notes to the currently selected MIDI device to test MIDI playback. Opens an audio transport to record sound that can then be embedded into the document. Opens an audio device settings dialog for to view and edit audio hardware settings. Allows access to the system MIDI synthesizer settings. Only available on the Macintosh. Imports a URL for a video clip stored on Vimeo or YouTube. See Import Video for more information. Imports an audio file into the document. See Import Audio for more information. Opens a Resource Manager for inspecting, deleting, and customizing resources such as audio, video, and images. The Teacher Menu is only available when a registered teacher signs in. Opens a directory window to locate the Harmonia's library folder. Removes (deletes) all imported scores from Harmonia's library folder. Turning off student role allows a teacher to then edit the document and access application commands that would otherwise be unavailable to the (student) user. 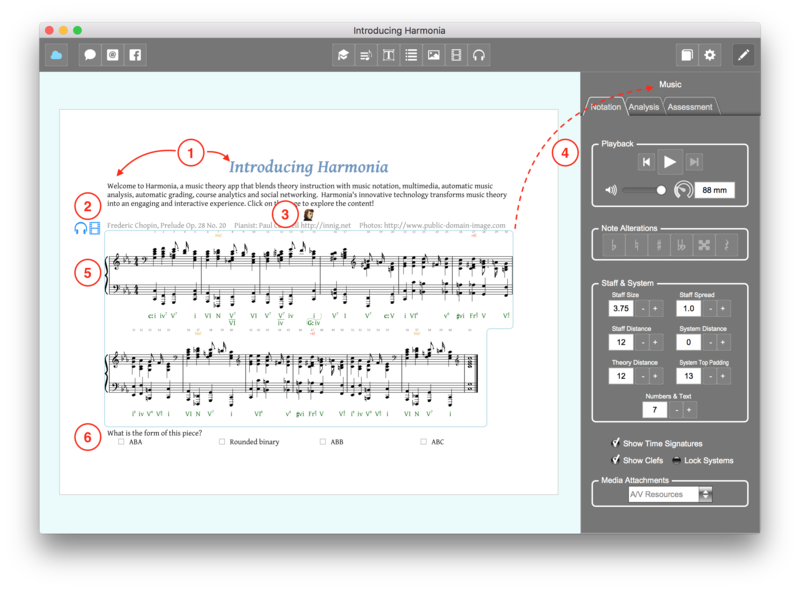 Opens Harmonia's on-line teacher documentation in your browser. The Windows menu contains a list of all the currently open windows. Windows are listed by title, selecting a title will pop that window to the font of the window stack and make it the active window. Opens a short tutorial on how to log into the Harmonia cloud and connect to your course content. A submenu of short tutorials explaining basic user interactions in the app, including how to complete assignments, how to edit musical scores, and how to enter music theory symbols into the theory line. Must read material for students! Opens a document showing Harmonia's version number and release information. Please be sure to include the application version number in any bug report. Opens a document that displays examples of Harmonia features. Opens Harmonia's on-line homepage in your browser. Open a log file containing information about the running status of Harmonia. Please attach the file to any bug report you send us.